Foster model 16392 UL Listed, Class 2 transformers are ideal for commercial, light industrial and residential lighting control applications. These proven transformers accept input voltages of 120/240/277/347V and deliver 24V output at 50/60Hz with 50VA capacity, so they are well suited for all common North American and European residential, commercial and industrial line voltages. Their compact size allows them to easily fit into new or existing panels, while their robust design allows them to withstand a direct short circuit for up to 15 days without a failure. 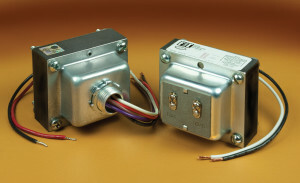 Foster 16392 transformers are ideal in low voltage lighting and lighting control panels, HVAC controls, alarm systems and home automation controls, irrigation panels and controls, door and gate openers, and other applications which require Class 2 power to actuate banks of relays, contactors and solenoid valves, illuminate pilot and low voltage halogen lamps, operate small motors and provide power to similar types of loads. Class 130 insulation systems ensures a long service life. Because they are Inherently Limited, they require no external fusing. UL Listed and C-UL Certified, UL 5085-3, CSA 22.2 No. 66, UL File Number E17029. Standard 6-inch long, color coded primary lead wires, 18 AWG, UL 1015, 105°C rated. Standard 6-32 combi-head screws for low voltage connection, lead wires optional. Foster Transformer has been making electronic transformers, power supplies, and electromagnetic components for over 75 years. Their corporate headquarters, Engineering Lab and primary manufacturing facility are located in Cincinnati, OH with additional manufacturing capacity available in China. The ability to manufacture their own tooling, fixtures and unique production machinery, allows Foster to provide quick turnaround, start-up. For more information contact Foster Transformer, 3820 Colerain Avenue, Cincinnati, OH 45223, (800) 963-9799, or info@foster-transformer.com.